The first time I was introduced to a concealer stick was 5 years ago. She was my officemate back then and we became the best buddy up to this point. The concealer stick that she bought for me has a Japanese name, I completely forgot what it is. My sister is the one who used it most of the time and I totally forgot about that cosmetic. 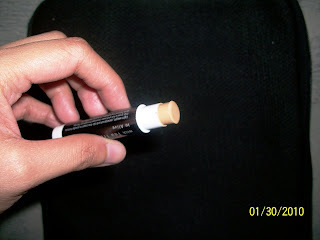 As I was browsing through my bookmarked blogs, I saw this concealer stick and I wanted to have one of my own! I was able to buy one last January 30 in SM Makati. I've been waiting since November for this product to be available on their SM stall and finally I got one. Happiness! The color that I purchased is ALIVE which is neutral golden beige. This discovery is made possible by Shen who featured this item on her blog last November 2009. She is my source/reference when it comes to Ellana Mineral Makeup since she's one of the avid user of these cosmetic brand and she always makes it a point to make a review of their items. I haven't tried the concealer yet but I'm hoping to try it next week. 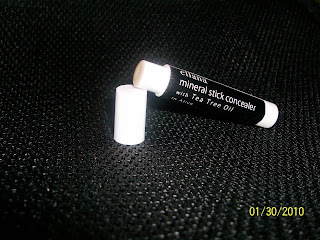 Will post my photo wearing this concealer for my eyes ;) Stay tuned!